World of Warcraft Pandaren Brewmaster Chen Stormstout Limited Edition fluctuates in availability! Restocking this item is becoming difficult and will see moderate price increases and will soon be unavailable completely! These items are brand new, factory sealed with contents in MINT condition, but please note: Due to the manner in which the manufacturer ships these items, we are UNABLE to guarantee COLLECTOR GRADE PACKAGING. If you require collector grade packaging please email us for availabilty of pristine packaging. Pricing increase for pristine packaging will be required, if available. This is the VERY FIRST pandaren collectible EVER!! World of Warcraft fans will be amazed and delighted at capturing the elusive (and world-celebrated) Chen Stormstout for the first time in 3D. The Pandaren Brewmaster Deluxe Action Figure is a limited edition, one-of-a-kind Blizzard exclusive! This premium-sculpted piece stands at a colossal 8 inches and features Chen's signature bamboo Bo staff and Brewmaster's keg. Packaged in a 4-color, spot UV collectors window box, the figure is ideal to also be displayed in box! Art Directed by Blizzard Cinematic Creative Director Nick Carpenter. Exquisitely sculpted by Ray Villafane and painstakingly painted by Eddie Wires. 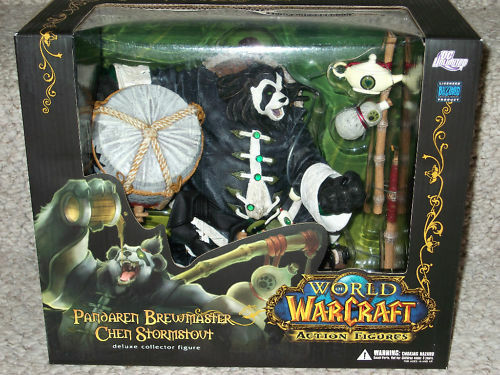 Pandaren Brewmaster Action Figure was a limited edition opportunity and subject to a first-come, first-serve basis for distribution.